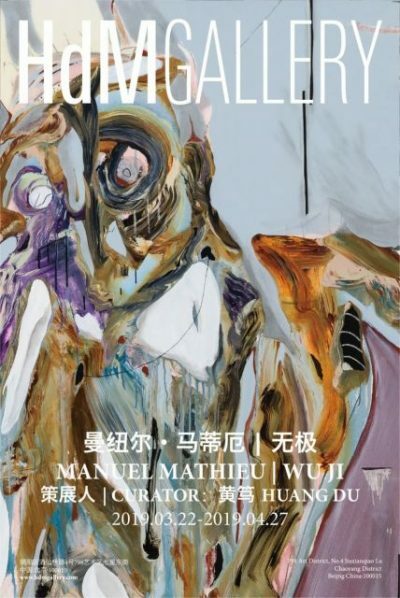 HdM GALLERY Beijing is pleased to present ‘Wu Ji’, a solo exhibition by Haitian painter Manuel Mathieu and curated by Huang Du. Announcing his arrival to the HdM stable of artists, this will be Manuel Mathieu’s first collaboration with the gallery. Following breakthrough shows in London, Paris and Chicago, the exhibition will be a unique opportunity to see his work in China. ‘Wu Ji’ will open on March 22nd and will be on display until April 27th 2019. Manuel Mathieu is a young artist who is working at the crossroads of abstraction and figuration. His works do not only contain the passion of Haitian folk art, but also permeate the language tension of Baconian painting. This kind of cultural interweaving reflects the artist’s transnational experience and characterizes his distinct visual language. Although artists create seemingly distorted visual and thrilling form in an abstract or figurative way they are also able to stimulate the audience’s curiosity, allowing them to experience existence, changes, association, life and death. The artist allows the audience to meditate on the artistic imagination across cultural boundaries and also to experience and express the fascination of humanity. Huang Du is the curator and art critic in Beijing. He is the academic director in Today Art Museum, professor in Institute of the Sociology, Sichuan Academy of Fine Arts and professor in Institute of Experimental Arts, Tianjin Academy of Fine Arts. He has published numerous critical articles and essays on contemporary art, mostly on magazines and catalogues in many countries. As a speaker and jury member, he was invited to participate in many important international art symposiums and art awards, including CCAA, The 7th Taishin Art Award 2009, Nissan Art Award 2013, “Lorenzo il Magnifico” of International Award of The 10th and 11th Florence Biennale 2015, 2017 and Yishu 8 Prize-China 2015-2018. The important exhibitions he curated in recent years are: Familiar Otherness: Art Across Northeast Asia; A Nomadic Life: Francesco Clemente in China; BRIC-à-brac, The Jumble of Growth, Another Choice: The Third Today’s Documents (co-curator with Gerardo Mosquera), and it was toured to Roma Galleria Nazionale d’ Arte Moderna e Contemporanea in 2018. Courtesy of the artist and HdM GALLERY Beijing, for further information please visit www.hdmgallery.com/en.